Top Las Vegas Spas | UNIGLOBE Direct Travel Ltd. Sometimes, a little too much "night on the town" requires some therapy of the spa kind. Sometimes, a little too much "night on the town" requires some therapy of the spa kind. Vegas, of course, is up to the task. World-class spas dot the Strip. Whatever atmosphere helps you relax, Las Vegas spas surely offer it. The Qua Baths & Spa at Caesars Palace offers total opulence and even a room where snow falls gently on your skin. But if you're looking for something more rock 'n' roll, the Reliquary Spa at Hard Rock Hotel has a hip, edgy vibe. Spas in Las Vegas offer a variety of specialty treatments and wellness services that aren't offered in your neighborhood back home. They are experiences you and your skin can only find in Las Vegas. The Spa at ARIA offers a salt meditation room where the lounge chairs actually vibrate to the music. And if you've got a whole group of spa girlfriends, book a spa suite for up to eight and make a whole weekend of it. East meets West as The Spa at Mandarin Oriental presents an urban oasis of traditional and modern techniques, including Vitality pool, ice fountain and a two-person Hammam. The 50,000 square foot Qua Baths and Spa features 51 treatment studios including three deluxe couple's studios, two personalized hydrotherapy tubs, three Vichy showers, seven facial studios, 35 massage studios and a Crystal Room. Enticing Roman baths will create a soothing immersive atmosphere for guests to relax, while high-tech 5,500 square foot fitness center is outfitted with techno gym equipment. You can also relax and experience snow falling from the ceiling in the one-of-a-kind Arctic Ice Room! The centerpiece of the 25,000 foot Reliquary spa is the Roman Bath for guests to be seen, socialize and commiserate with private cabana-type alcoves and lounge space. The Bath House has capabilities to turn the space into an entertainment area for small parties and group functions. It has 21 treatment rooms, a private studio for pole dancing lessons, and a fitness center. When you're ready to get away from it all, The Aria Resort Spa and Salon offers you a lavish way to unwind...and to re-energize yourself. Relax on heated-stone ganbanyoku beds. Breathe the fresh air in the infused salt room. And let your stress melt away in separate men's and women's spas with eucalyptus steam rooms and redwood saunas. Or work out in the state-of-the-art fitness rooms and group exercise studios. 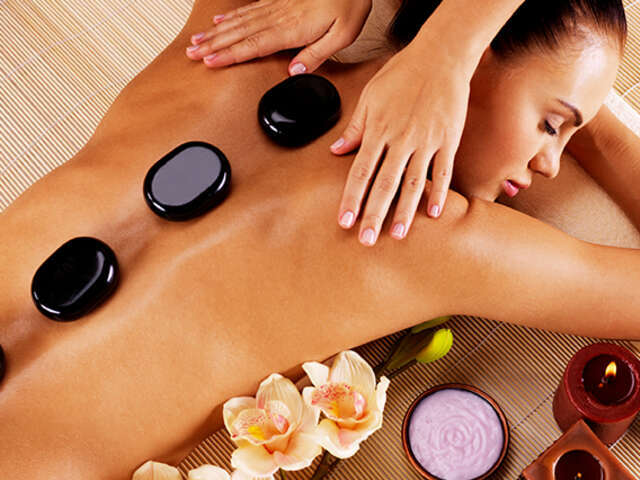 Enjoy massage therapy and skin care treatments from around the world. Then mingle on Las Vegas' only co-ed balcony pool with a stunning view of sparkling beautiful pools. East meets West as The Spa at Mandarin Oriental debuts an urban oasis featuring spacious, sunlit facilities inspired by traditional philosophies and modern technology. The tranquil ambiance and stunning design, decorated in a 1930's Shanghai style, provides the perfect spa experience that soothes the five senses including calming herbal teas, blissful music, aromatic scents, luxurious decor, and indulgent treatments. With water treatments including Vitality pools, steam rooms, and Ice Fountains, guests can relax tired muscles and revitalize dry skin before and after therapist treatments. Unique to Mandarin Oriental Las Vegas, the Laconium room features temperature-controlled Tepidarium chairs with an unparalleled view of the city. For a more social gathering, try the traditional Turkish Hammam featuring a heated marble table for exfoliation treatments; women can enjoy the two-person Rhassoul, an authentic cultural experience where guests are covered in clay and exposed to dry and wet heat to release toxins and nourish the skin. An oasis of luxury and rejuvenation in the center of The Las Vegas Strip, this 43,000 square-foot sanctuary is inspired by the desert&rsquo;s canopy of sky, mystifying sand sculptures, and moonlit nights. Featuring 30 treatment rooms, a luxurious penthouse spa suite and an authentic Turkish Hammam, Sahra changes perspective, creating a path to balance, harmony and calm. Unique treatments are evoked by desert cultures from around the world and sensual therapies are infused with Arabian beauty rituals. Relax in the Space Between, a serenity lounge permeated by falling waters or bask in the immense heat of the motherstone through a one-of-a-kind Hammam experience. Upon entrance you&rsquo;ll discover that this is no ordinary place, but a seemingly simple yet wonderfully complex luxury spa and retreat. The excitement of Wynn Las Vegas nights are countered by the serenity of the Mobil Five-Star rated spa and The Salon, where the treatment rooms, luxurious products and professional staff create a sanctuary for guests. Relax in the care of highly trained professionals. Whether you're here for a simple manicure or a pre-wedding updo, the spa's treatments are highly personalized and always tailored to your needs and interests. The spa offers 45 treatment rooms for massage, body treatments, facials and hydrotherapy. Separate women's and men's facilities with showers, steam room, sauna and whirlpool ensure your comfort and privacy. Lockers with spa robes and slippers are provided, as well as hair and body care amenities.